The civilized world must change thinking! Not all President-elect Tweets in the past have proven so spot-on as the one, Donald Trump tweeted yesterday following the presumably islamistic terror attack on a German christmas market in Berlin, and further terror attacks in Istanbul and Zurich the very same day. He could be right. By now, we know the symbolic public and state procedures that have followed similar attacks in Paris, Nice, Brussels, Istanbul and elsewhere: We condemn the attacks, we stand in solidarity with the families of the victims and the traumatized cities, we vow to protect our open societies and democratic values, we will not allow terrorism to influence our daily behavior and we will make intelligence and security services around the globe co-operate more closely. But is this really enough? Debatable. The real danger that we face today is, that by applying a too soft and open view on the terrorist threat, we will undermine the very basis of our democratic systems: the monopoly of power of the state in combination with the state responsibility to protect our safety. In case that a democratic Government cannot render this guarantee, people will start to go for the extreme. And select a leader who can deliver on the process without any compromise or as a Philippine citizen had put it yesterday: Duterte (President of the Philippines) is bad for human rights, but the people can walk safely in the streets again. The problem with these leaders is that once they are unleashed, it is very difficult to tame them back. The objective must be total eradication and fight on all fronts. Half-hearted responses will not work. 100% registration of all refugees and returnees from war zones. Regular security checks. Maximum surveillance. Check of identities with home countries. Lots of surprise checks and controls. 100 % surveillance of any islamist movement. Zero tolerance for islamist ghettos or no-go zones for police and security forces. Immediate two year suspension of Schengen agreement for all countries. Military grade fight agains trafficking groups in EU and abroad. Immediate repression against all open and covert market places for weapons within Europe. Create European centers of excellence to strongly oppose terrorism: finance, cyber, trafficking, identities. This could be a great European project, better than building new armies. Serious discussion with islamist leaders around the world to make them understand their responsibility for peace and to motivate them for strong and sustained messages against war, terrorism, hate. If they do not comply, immediately blacklist them and their followers, and fight them financially and electronically. Out and highlight Governments and leaders loud and clearly who support, finance or tolerate terrorism or provide hiding space for terrorists. Stop immediate co-operation with countries who are not complying, even if this comes with an economic impact for us. Start UN Security council initiative to fight terrorism jointly with all veto powers in the UN: US, Russia, UK, France and China all have a shared interest in stopping this danger for humanity. Learn from countries like Israel, who live for decades with enormous terrorist threats how to protect, prevent and enjoy life at the same time. It is possible. But surveillance and protection have to start much earlier and at different inflection points, and the European countries have to learn a lot. Although helpful in the long-term it does not help now to talk about development aid or peace initiatives for crisis regions. The enemy has already arrived and moves within our societies, as all terror attacks in the past have painfully proven. We need to act in our countries. State of the Nation Comments Off on The civilized world must change thinking! 2016 could be regarded as a year of political and economic consolidation for Ukraine. With the ongoing Ukraine/Russia conflict posing a threat to the future development as well as the new US policy towards the given conflict being yet to forecast, there are definitely plenty of positive signs on Ukraine’s political horizon. 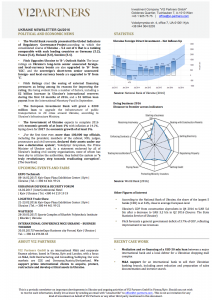 We will share quarterly information on the developments in Ukraine in our new UKRAINE NEWSLETTER section. Please see the Pessimism Report 2017, as it was published today on bloomberg.com . They had forecasted for 2016 the Trump Triumph and the Brexit. Chapeau. A little bit dark to read, especially as most of the events described are not entirely unrealistic. But to put it in the words of a famous future Ex-President: The Sun will also rise tomorrow, and Mr. Hawking has promised another 1.000 years to mankind. Good Morning to the New Normal. Italy has voted to remain in a political deadlock and to protest against the ugly truth of necessary reforms. Austria and the shatters of the European old guard are celebrating the defeat of the Austrian (Far-)Right with a convincing (?) 53-47 score, while the country itself remains hugely divided. In the mean-time the RealDonald has decided to save on the US diplomatic corps and to solve all urgent international matters by President-elect Tweets. But no worry, if things turn sour, the European Central Bank is ready to drown us in ever more money and to punish any type of cash hoarding or positive bank balances. Stock and Currency markets take account of this new normalcy, major stock indices and the Euro rise. One is inclined to keep calm and think “So What?”. In reality we are witnessing the rapid dissolution of the European Union, and if politicians do not find fast any common and stable ground to put the European institutions onto, the noble-prize of peace awarded project will soon be history, blown away in an ugly, and un-controlled way. Of course there is rightfully some “Angst” going around, but things might in the end turn out much better than what they look like, and this is perhaps what financial markets already predict. An old wisdom is saying, “You have to face reality, before you can shape the future”. Some countries cannot survive in the Euro, their countries suffer. Italy is the most prominent example. Europeans do not want more economic or political integration, they want to stay in charge of their own countries. There is no wish for a United States of Europe. Greece without other tax payers bleeding, is bankrupt. The economic spread is rising and fast and the chill factor is enormous: poor and rich people are not paying taxes at all (see football leak), our Governments are accepting it. Middle income clusters are strangled and cannot build any long-term wealth. Pensions are not safe at all. When generations of people live until 90years+ and young people do not reproduce, we cannot go into retirement with 60-65 years. We need to increase age of entry into retirement and decrease pension payments, and drastically, or: create other source of tax income to pay for it. The Central Banks have created the mother of all bubbles. They have no idea how to come back to normal interest rates and state financing. We have too many immigrants and we do not want more. We will not be able to integrate the immigrants smoothly into our labor markets. Interventionism and change of regime activities for the sake of democracy and human rights have led to a complete Middle East chaos, instability and rise of global terrorism. Transgender toilets and adoption rights for gay couples are not burning issues for most of the people. Whoever tells a truth, is not a populist or an extremist. Once the ugly truths are digested and acknowledged, we will realize that the future is bright. First, Europe is much more than the European Union, and the friendship and respect and interrelations between the countries are enormous and lasting, and that vast diversity is the real asset of the continent. Second, there is a real chance, that we re-discuss the areas in which more integration is needed (like defense, fight of terrorism, border protection, climate control), and the areas where less integration can do a lot of good (daily life, monetary policy, taxation). Let us not forget, that Europe is not the European Union, it is the European idea of peace, friendship and diversity, stability of borders and human rights that make up Europe. State of the Nation Comments Off on Europe Must Not Die!